Over the past month, this project has had a lot of attention for which I’m very grateful. My e-mail inbox has been filled with some fantastic comments and constructive criticism which I’m slowly working my way through, and there’s still comments on this blog and on GitHub which I haven’t got round to addressing yet. I’m starting to collect all the suggestions and bug reports to try to work out the best order to tackle them, but if you think I’ve missed something then I’d love to hear it. The GitHub issue tracker is the best place to put these as I can manage them a bit better. I’ve prepared a new test version in which I’ve tried to focus mainly on stability and performance improvements. I’ve squashed a few bugs that would cause problems if you tried to run the game with incomplete game files, and improved the error handling so that if something does go wrong, there’s a better chance of recovering from it. I’ve held off from putting anything “new” in there for the moment, but there’s definitely some new features I’d like to squeeze in before I’m done with version 0.3. Edit: This version has been released. Check here for the latest version. I would recommend uninstalling the old version before putting this one on your phone. You can read more detailed release notes on the download page. Edit (13/07/2012): New new test version available! I figured this was worth posting about because this is the first version that doesn’t require any manual steps in order to get it up and running. You can just download the APK and the wizard will give you the option of downloading the demo version of Theme Hospital. Of course, you can still copy over a full version of Theme Hospital if you want, but the demo version will let you play a cut-down version without the hassle. In other news, simonjonnemeth from GitHub has uploaded a superb video of the application on his YouTube channel which shows the full process from installing to playing. I’ve used the Android SDK for a few bits and pieces, but I’ve never tried to work with the Android NDK before. 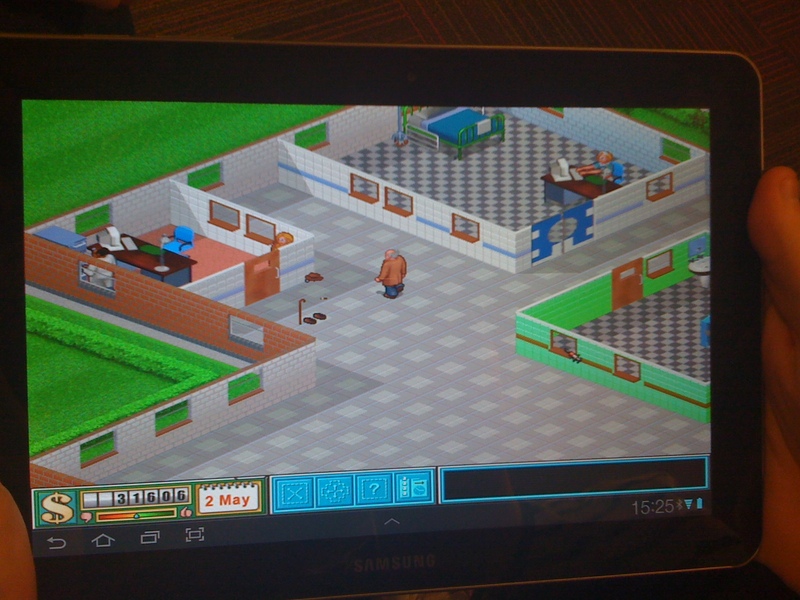 So, as an attempt to try to find my way around it, I set myself the goal of porting one of my favourite games – Theme Hospital – to the Android platform in the form of CorsixTH. I’ve followed CorsixTH for a while, and they’ve made superb progress in recreating a Theme Hospital clone using the original assets from the game. There’s still a fairly extensive list of features in the original game that haven’t yet found their way into CorsixTH, but a large amount of the core game functionality is there. CorsixTH has a great choice of open source libraries powering it, which actually made compiling it for Android surprisingly easy. In fact, SDL and some libraries that commonly accompany it have already been ported over with great success which really meant that all I had to do was rename a few functions and create a few makefiles to get it running; I’m sure that someone with experience with the NDK could do it in half the time it took me. In any case, you can get the source code from my GitHub repository and there’s a link to the APK in the downloads section so that you can install it straight to your Android device without compiling the project yourself. I would happily invite anyone to fork the repository and make some improvements as there’s still a fair bit left to do, such as getting it to scale on different device resolutions and scrolling by dragging. Edit: Now also available on Google Play Store!